Fireworks as seen from the Main Street Bridge in downtown Jacksonville. Still haven’t finalized your New Year’s Eve plans? No worries. There is plenty to do on the fly around the First Coast. The Landing’s bars and restaurants also have entertainment and some private events. For a complete list of options at the Landing click here. Kickoff is at 7:30 p.m. between the North Carolina State Wolfpack and Texas A&M University Aggies. Happy hour begins at 4:30 p.m. at the TaxSlayer Tailgate Party. A concert featuring country star Cole Swindell and postgame New Year’s Eve fireworks will follow the game. MOCA's Countdown Bash features a dance party featuring Mama Blue, DJ Catharsis, live art performances, eats by NOLA MOCA and an open bar throughout the night with Intuition Ale Works and Manifest Distilling. MOCA is across Laura Street from Hemming Park. Myth Nightclub on East Bay Street will feature an upscale environment with a red carpet, party favors, midnight champagne and balloon drop. Another option is to ring in the New Year and close out the old with Party Legion's sixth annual event with The Influence Crew and friends at the Cuba Libre's Ultra Lounge on Atlantic Boulevard. They'll be ringing in the new year with Miracle on the Square and The Band be Easy at the Grape and Grain exchange in San Marco. The downtown speakeasy’s New Year's Eve event will feature signature cocktails, a free champagne toast at midnight and dancing the night away with live music. Live music, open bar and champagne at midnight will help mark the occasion at the downtown East Bay Street upscale steakhouse. River & Post on Riverside Avenue will have a New Year's Eve Masquerade sponsored by Marlin & Barrel. The Black Sheep restaurant in Five Points is hosting a rooftop party with a new canopy. There will be a DJ and a toast at the stroke of midnight. Conductor Courtney Lewis and the Jacksonville Symphony will be performing for New Year’s Eve. The evening begins with an elegant program of Viennese classics, followed by a New Year’s party with the Chris Thomas Band and capped by a view of the fireworks on the river at midnight from the vantage point of the Times-Union Center for the Performing Arts. The Beach Blast Off takes place at St. Augustine Beach Pier Park with live music, food and drinks, a kids' zone, and a fireworks show. The Comfort Zone offers over 30 food vendors and a beer, champagne and wine tent. Local bands will provide the music and a 65-inch TV will keep everyone up-to-date on the New Year's Eve festivities in New York City and around the world. There's face painting, a photo booth, and carnival rides. The Kids' Zone area includes several inflatables and hands-on activities. The fireworks display to music takes place at 8:30 p.m., with the after-party continuing until 10:00 p.m. When: 4:00 to 10:00 p.m. Fireworks at 8:30 p.m.
Where: St. Augustine Beach Pier Park is located at 350 A1A Beach Blvd. For more information call (904) 471-2122. There will be a shrimp drop in Fernandina Beach New Year's Eve. 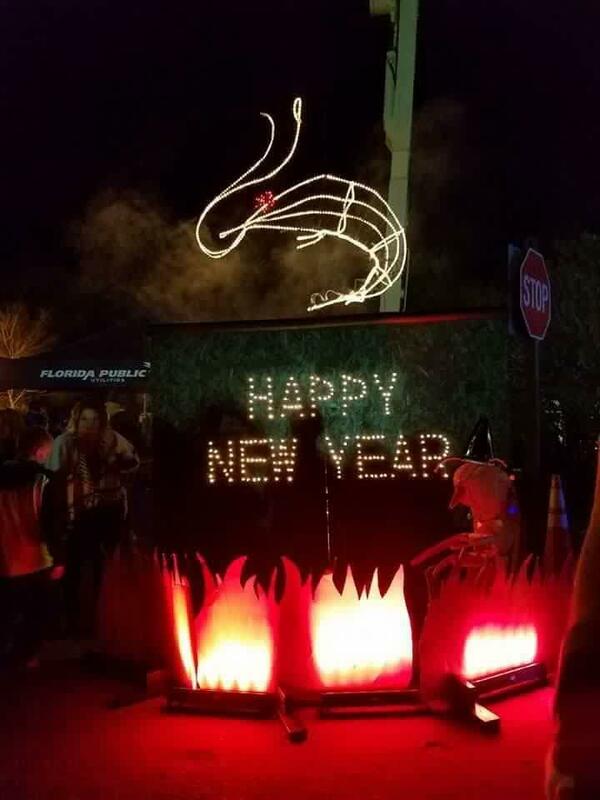 The 4th Annual New Year's Eve Shrimp Drop in Fernandina Beach will feature live music, laser shows, kids' zone with bounce houses, food, and commercial vendors. Shrimp will drop at 7:00 p.m. followed immediately by fireworks. If you’d rather curl up at home, WJCT Channel 7.1 (channels 8 & 440 on Comcast) has a full line up of New Year’s Eve fun. It starts at 8 p.m. with Live From New York Lincoln Center for the New York Philharmonic New Year's Eve with Renee Fleming. Then at 10:30 celebrate the 2018 Austin City Limits Hall of Fame with host Chris Isaak as Ray Charles, Marcia Bell and Los Lobos are inducted. Performers include Norah Jones, Robert Randolph, Gary Clark Jr. and more.